Marriage and Evangelism Run together . . . . Go figure! Some friends of mine were married over the weekend. how marriage can be a revelation of God Himself, where male and female come together as one yet maintain some distinctions. I’m probably messing up all the wonderful statements the preacher made, but the theology of it all has led me to meditate reflect a little about the image of the church as the Bride of Christ. In Matthew 22:1-14, Jesus describes the kingdom heaven in terms of a wedding banquet given by a father for his son. 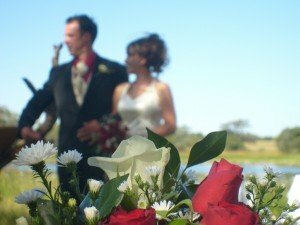 Why does the bible use wedding imagery to describe the Kingdom? I don’t have all the answers, I’m just raising the question. There is a mystery to marriage (when it’s healthy, of course) that reflects the nature of God. Marriage is a place to be loved unconditionally, and a place to love unconditionally. Marriage is a place to discover how to love and how to be loved. Marriage is a place to experience the depths of romance, and the depths of pursuit. In the security of marriage, one can discover the joys of pursuing and being pursued. Is God’s love so vast and deep that the deepest or richest image of it on the earth is in the mystical intimacy of marriage? And your point is . . . . . .
is more than a concern about people’s eternity. What fuels me is that I’m convinced that God loves me, and the bridal theme in Scripture stirs something indescribable in my heart. Peter speaks of an indescribable Joy (1 Peter 1:9ff). It wells up from within and over flows. It’s the deep [in me] that cries out to deep [in God]. It overflows. It’s subjective no doubt. I can’t put words to it. But it fuels me all the more — I can “feel” the good news. I can feel the irresistable draw of God’s love. I can enjoy God! God enjoys me! I can have all the tools I want about how to evangelize. But without the passion of relishing in the love of God for me, I’m just relaying information hoping to convince somebody of the truth. Delighting in God’s love for me gives me the passion that communicates conviction of truth. I’m not sharing what some speaker or teacher has taught me to repeat. I’m communicating what I believe and have discovered in life. It’s truth that has sunk into the heart and then oozes up from the heart with an intoxicating quality. Just as I know the gospel (information, facts, theology, etc), I feel the gospel (passion, compassion, concern). The left brain and right brain together. Truth with passion. Passion propels me to invite people to discover truth with me. What does the bridal theme in Scripture stir in your heart?